It’s film festival season and we would like to welcome TIFF to the neighbourhood. 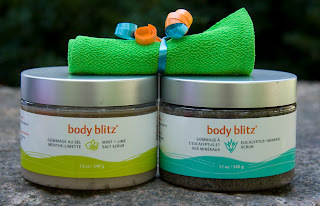 If you were wondering how all the stars shine during the festival, look no further than body blitz for some beauty secrets. A glow begins with clean, smooth skin. Our body scrubs and scrub mitt help remove pollutants and dirt from the skin, stimulate the blood and lymphatic systems and remove aged skin cells leaving your skin silky smooth. And don’t forget to moisturize with our mint~lime body lotion enriched with Moroccan argan oil. To plump up the skin and give your face a glow, use our argan oil face serum daily. Just a few drops will cover the entire face. At body blitz we only use extra virgin cold-pressed argan oil for our face serum. This high quality Moroccan oil is the world’s richest natural source of vitamin E and has remarkable anti-aging properties. Follow this with our revitalizing face moisturizer. It combines the best of nature and science, with Moroccan argan oil and Renovage - two super-star, anti-aging ingredients. So get your skin radiating and you too can shine during the Toronto International Film Festival.